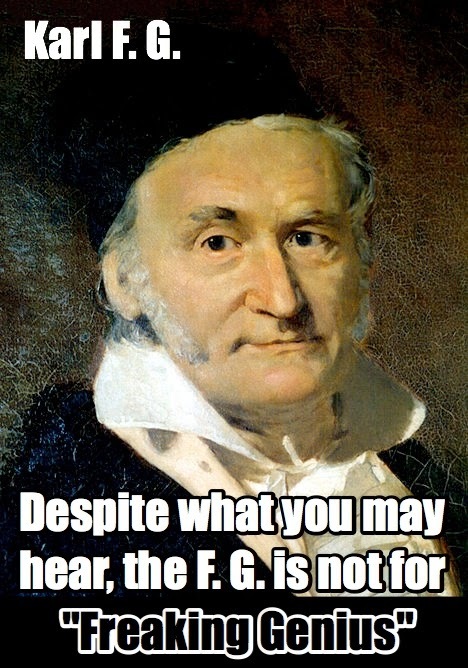 I have a particular fondness for Gauss, as he was my entry into math history. John Hocking, whom I usually refer to as my undergraduate math guru, was, by great fortune, my math teacher for the first two years at Michigan State. A good researcher himself, he brought math alive with deep connections, intriguing applications, lively stories of discovery and some history of the great mathematicians. It had never really occurred to me to wonder who invented the stuff we were studying. Unthinkable in most other subjects. But when Karl Friedrich Gauss came up, the usually passionate Gibb kicked it into another gear. "This is a man whose name should be as famous as Beethoven's!" And yet none of us had heard of him! "Like the magnetic unit?" one person asked. In that pre-Google world of 1982, it took some effort to find out more. One day in our capstone class is devoted to Gauss, then. Given an hour to talk about him, what should you cover? One interesting thing in a math history class is that the closer we get to being relevant to today, the harder the math is to understand. And class is diverse in the sense that despite all being math majors, there are future elementary teachers, secondary teachers, grad students and applied mathematicians. For Gauss, he loved number theory so, and modular arithmetic was so crucial to his number theory, I came up with a game to increase experience with modular addition. It seems to me that in a half hour students go from hesitant to fluent, and the discussions at the start of playing are powerful. These directions are in particularly good shape, as Sue Van Hattum helped edit them for her upcoming book. Hope you give it a try and enjoy it as much as we do! P.S. Looking for more Gaussian fun? Here's today's longer than usual list of To Do choices. Make sure you understand the Fundamental Theorem of Algebra. One neat result of Gauss was proving Fermat’s conjecture that every counting number can be expressed as the sum of three triangular numbers. Good thing to play with, and fun that it connects to Gauss’ 7 year old result. work on a classic Gauss problem: how many ways are there to write a whole number as a sum of perfect squares? For example, 5 has 8 ways, not using zeroes but yes using negatives. So (-1)^2+2^2=5 is one way. Follow Mike’s process through explaining that problem, Keep notes and make sense yourself of what he and his kids share. 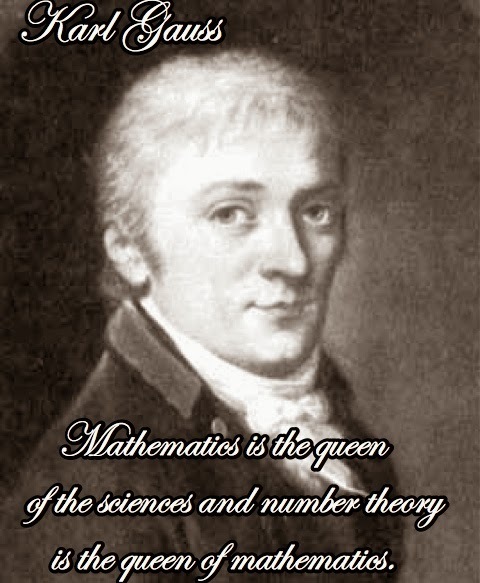 Gauss was connected with the first great female mathematician of the modern era, Sophie Germain, who had to overcome terrible sexism. Gauss was an advisor to Bernhard Riemann, who made groundbreaking advances in geometry by describing geometric surfaces and more with complex-coefficient equations. Also responsible for the mysterious zeta function, and the as-yet-unsolved Riemann hypothesis. Gauss’ modular arithmetic is the foundation of Public Key Cryptography. Here’s a clear exposition. A pretty clear explanation of the connection between AGM and ellipse perimeter.